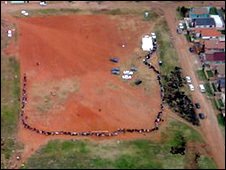 South Africans have been queuing to vote in what is likely to be the most competitive general election since the end of apartheid in 1994. Many voters were wrapped in blankets, hats and scarves on a chilly day and turned out hours before booths opened. 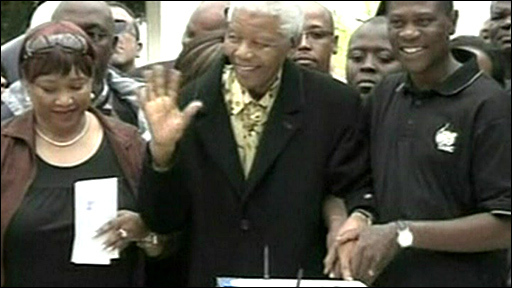 Former leader Nelson Mandela, 90, was among those voting. The ruling ANC - led by Jacob Zuma - is expected to win, but it could lose its two-thirds majority in parliament which allows it to change the constitution. Among its rivals is a new party - Congress of the People (Cope) - formed last year by a group who split from the ANC after ex-President Thabo Mbeki was replaced as leader. Some 20,000 polling stations are being used for more than 23 million registered voters. Polls close at 2100 local time (1900 GMT). BBC correspondents around the country reported lively groups of voters braving the wintry weather to cast their ballots. Many voters arrived hours before polling stations opened - some wrapped in blankets, clutching mugs of hot drinks. By midday, most of the main political figures had voted. Mr Mandela had already pledged his support to the ANC at a rally last week, but Mr Mbeki was widely rumoured to be considering backing Cope. After casting his vote in Johannesburg, Mr Mbeki did not confirm the speculation, saying: "People should vote for who they want, not out of fear, but for the party they believe will deliver the South Africa they want." In a polling station queue, the leader of the official opposition Democratic Alliance party, Helen Zille, told the BBC that South Africans needed to "stop Zuma to save the constitution". "He's a one-man constitution-wrecking machine and what he says and what he does are two different things," she said. The alliance has repeatedly suggested that if the ANC retains its two-thirds majority, it might change the constitution to protect Mr Zuma from prosecution - claims he has denied. Voting in his home state of KwaZulu-Natal, Mr Zuma told cheering supporters: "When I grew up, I did know that this day would come. "This makes me feel great and it's a feeling far different from the one that we had under the apartheid government." Archbishop Desmond Tutu, who has described Mr Zuma as an unfit president, cast his vote in Cape Town. "Because of the role the ANC has played in the struggle, and in the first years of our freedom, most people would have tended to vote ANC," he said. "Now, it is no longer quite so straightforward. People are asking questions, which is a good thing, I mean, that is what a democracy is." Charges of corruption against Mr Zuma were dropped just two weeks before the poll, after state prosecutors said there had been political interference in the case. Many of the new voters are young people who have little memory of the struggle to end white minority rule, which brought the ANC to power. One first-time voter, Bhekisa, was among the first at the polling station in Johannesburg City Hall. "It's so cold today, you can see it's freezing. But I am excited because I am here," he said. While another, Pam Morris, said she was keen to vote for a change. "That is what we have to look for every day. Change. A better life," she said. Analysts say Cope's emergence energised the early stages of the election campaign, but the party's popularity seems to have diminished in recent weeks. Cope fielded a relatively unknown presidential candidate, former Bishop Mvume Dandala, who analysts say has struggled to make an impact. Some say the real battle is between Cope and the Democratic Alliance - for second place. Neither party has ruled out entering into a coalition after the election. An opposition coalition would provide the biggest challenge to the ANC since it was first elected in 1994, ending years of white minority rule. Send your pictures to yourpics@bbc.co.uk , text them to +44 7725 100 100 or if you have a large file you can upload here .